I’ve come to dislike the term ‘Earth 2.0.’ It’s not so much the idea of a second Earth as the use of 2.0, which in our technological era invariably recalls software updates. Windows 2.0 was better than Windows 1.0, but Windows 3.0 was the one that really took off — the idea here is that progressive iterations improve the product. I’d rather see us use ‘Earth 2’ than ‘Earth 2.0,’ for the latter implies a new and improved Earth, and I’m not sure just what that would be. Speculating about that is, I suppose, a key activity of philosophers. But Earth 2.0 has stuck as a way of designating a planet much like our own. Here too we have to be careful. A planet with liquid water on at least parts of its surface might exist around a red dwarf, packed into a tidally-locked orbit and divided between a frigid night side and a day side with, perhaps, only a few zones where life might flourish. It’s not Earth 2.0 because it has a star that never moves in its sky and its susceptibility to solar flares offers evolutionary challenges much different from those life has experienced around our G-class Sun. So we can reserve Earth 2.0 for planets that orbit around their star in roughly the same way we do, meaning a star much like the Sun and a planet of Earth size in a more or less circular orbit at about 1 AU. To really hammer home the comparison, we should ask for a star of a certain age. We might find a planet meeting all these characteristics circling a star so young that life is unlikely to have taken hold, assuming that life takes the same kind of path it did on Earth (obviously, nothing more than an assumption). But the Earth 2.0 that seizes the popular imagination will so closely mirror our own in age, orbit, and size as to suggest a living world. 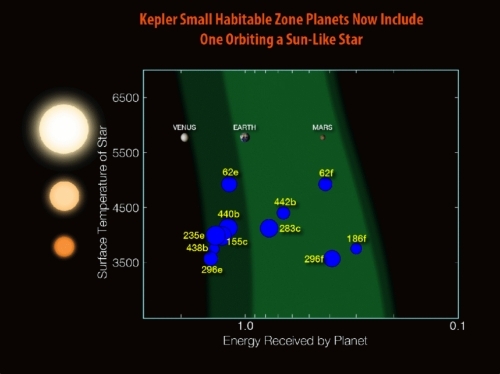 Image: The sweep of NASA Kepler mission’s search for small, habitable planets in the last six years. The first planet smaller than Earth, Kepler-20e, was discovered in December 2011 orbiting a Sun-like star slightly cooler and smaller than our sun every six days. But it is scorching hot and unable to maintain an atmosphere or a liquid water ocean. Kepler-22b was announced in the same month, as the first planet in the habitable zone of a sun-like star, but is more than twice the size of Earth and therefore unlikely to have a solid surface. Kepler-186f was discovered in April 2014 and is the first Earth-size planet found in the habitable zone of a small, cool M dwarf about half the size and mass of our sun. Kepler-452b is the first near-Earth-Size planet in the habitable zone of a star very similar to the sun. Credit: NASA Ames/W. Stenzel. This is a planet that has been in its star’s habitable zone for longer than the age of the Earth, ample time, as Jenkins noted, for life to begin. Although the size of the world — intermediate between Earth and Neptune — makes it too large to be a true Earth analogue, Jenkins believes that it has a “better than even chance of being rocky.” Thus we could be looking at a world that models changes our planet will be making in the remote future. Earth 2.0? Not if we’re dealing with a super-Earth. 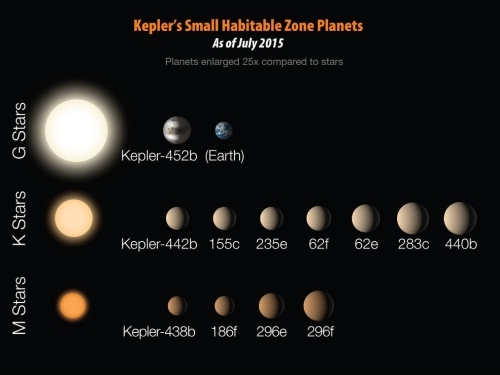 But what an interesting world Kepler-452b seems to be. We have the example of planets like Kepler-438b and Kepler-442b to remind us of worlds that might be rocky like the Earth, but orbiting different kinds of stars, in this case red dwarfs. No Earth 2.0 among that lot either, but it’s clear we’re moving in the right direction. Image: Since Kepler launched in 2009, twelve planets less than twice the size of Earth have been discovered in the habitable zones of their stars. These planets are plotted relative to the temperature of their star and with respect to the amount of energy received from their star in their orbit in Earth units. The light and dark shaded regions indicate the conservative and optimistic habitable zone. The sizes of the blue disks indicate the sizes of these exoplanets relative to one another and to the image of Earth, Venus and Mars, placed on this diagram for reference. Note that all the exoplanets discovered up until now are orbiting stars which are somewhat to significantly cooler and smaller than the sun. Kepler-452b is the first planet less than twice the size of Earth discovered in the habitable zone of a G-type star. Credit: NASA Ames/N. Batalha and W. Stenzel. It’s good, although I think it’s less likely to be a habitable world than Kepler-62f. The size is a problem – if it has a thick atmosphere plus the higher light, there’s a good chance the planet is a super-Venus. I’d bet that super-Earths are more likely to be habitable when they’re receiving less sunlight than Earth gets on average, since their thick atmospheres can make up for less sunlight (although that also lowers the energy available for photosynthesis). As Brett said, 62f plus 186f and 667Cc, in my opinion, still more likely to be habitable. I don’t like how the media and astronomers keep selling the idea that a planet to be habitable need to be “Earth-like”, our planet suffers from periodic long and harsh ice ages for example and have too cold polar regions and too hot and dry deserts. While it is uncertain how much land can be habitable on a planet orbiting a red dwarf, i believe some parts can still always be habitable, the star flares may make things harsh, but certain life there evolved to resist it. The problem i see with M-stars is the very fact we humans live on a G-stars, if all star types have the same habitability factor, we are supossed to be on a M-star since they make up the great majority of the stars, the odds to end on a G-star is fairly small… and we we are, somehow this lead me to think M-stars have issues we still don’t know. Finally, while G-stars seems pretty good for life development, somehow i still believe K-stars (late K’s to early G’s) are the best for life to thrive, longer life span and usually no tidal-lock issues and no flares. Anyway, great news, and i still waiting for a planet on the habitable zone of any star of Centauri system on follow up missions, since Kepler is not designed for that. The gravity at the surface of the planet would also be higher if the estimates of it’s size and mass are correct. If it is 60% larger in radius and 5 times as massive, then the surface gravity would be 1.95 times that of earth. Not sure what that means in terms of life, but as noted above, holding on to a thicker atmosphere could cause issues. Looking forward to when they will be able to determine if moons exist around such planets. I guess now what we have to answer is can we detect Oxygen in the atmosphere. Since Kepler launched in 2009, twelve planets less than twice the size of Earth have been discovered in the habitable zones of their stars. Great. But why is NASA still promoting the pre-Kepler estimate of where the rocky planet transition is? Since it orbits a Sun-like star, it is not too bad of a potentially habitable planet candidate. Thankfully, even better ones are yet to come! That’s a staggering figure when you stand it against Fermi’s paradox, a people 1.5 billion years ahead of us should have colonized the entire Virgo Supercluster by now, that is, if widely held expectations of interstellar expansion and space travel were even remotely accurate. I should add that at 1.5 gee (in preparation for surface forays) it would only take 9.5 years ship time. And of course a bonus trip 2400 years into the future upon return. Sadly, the lower than expected sensitivity of Kepler (because of some unanticipated starlight noise issue, IIRC) has cost us dearly. Kepler was designed to detect Earth-like planets, instead it now falls just short of that goal. This is why we are all strenuously reaching for Earth 2, but are left with a smattering of planets that are bigger, hotter, or around smaller suns. So close, yet so far away! Not to detract from Kepler’s value, which is in characterizing much of the other parts of the planet parameter space. Most of all, in my opinion, Kepler has shown us that if anything about our solar system is special, it would be that it has so few planets. Note that even if the solar system were perfectly positioned for Kepler, not a single of our own solar system’s planets would be noticeable. I sure hope our next planet-finding mission will be luckier in the Earth-like department! I’m with Eniac here. From a few years back where just about every planet discovered smaller that 3 earth radii was hailed as an “Earth 2.0”, we now have the kind of disappointed opposite reaction that seems to inevitably follow too much media hype. ‘Are we there yet’? No. Perhaps if Kepler had lasted another two years we might be having a different discussion. However, a cool discovery nonetheless! How quickly we get jaded. What I’m interested in are any ‘2 transit only planets’ that the Kepler team might be sitting on because 3 are needed in the normal pipeline. Kepler lasted long enough for quite a few Hz G star systems to throw up only 2 transits. I’d be fascinated to know if any of those might be getting followed up, as difficult as that might be…. Greater internal heat (assuming a higher mass of radioactives), a higher mass to surface area ratio, and a hotter sun, all suggest a warmer planet. Is the gravity of 452b enough to keep it’s hydrogen from escaping over time? If not, then 452b could dry out. That, and it’s “starting” water content, would be an upper bound for it’s habitable period. The only way to truly judge the life potential of *any* star, regardless of its spectral type, is to observe its planets spectroscopically (which we should be able to do before too long). If a planet has a spectral signature of oxygen coexisting with methane in its atmosphere, someone would almost certainly be at home there (whether they could communicate intelligently with us is another matter). Even A-class stars bear observing (at least in the radio portion of the spectrum), because some of them might be orbited by artificial worlds (space colonies) whose founders settled there from elsewhere. Such stars would provide plentiful amounts of light, heat, ultraviolet light, and X-Rays for all kinds of (shielded) agricultural and (un-shielded) industrial processes. No even the Jovian worlds? Then how has Kepler been able to detect smaller exoworlds than them? That is unfortunate to learn that Kepler is not quite as sensitive as it was supposed to be. Let us hope better telescopes will be sent up soon. I also cannot help but wonder if looking for the equivalent for our home if the goal is to find alien life is a mistake? And if the real goal is to find the equivalent of another Earth to one day colonize, that is also a potential mistake for multiple reasons. One of them being an Earthlike world might already have residents. OK….we’ve found a possible Earth. It seems to me a simple SETI experiment would be to observe the star’s spectra for anomalies. The easiest way to announce your presence would be to aim a laser at the sky on your equator tuned to a line in the star’s spectral signature. Anyone observing would a see a periodic spectral change that corresponded to your planet’s rotation. It probably wouldn’t even take that much power. @ljk: Eniac’s right, Kepler wouldn’t have noticed our own solar system planets. But that’s not because they’re too small but because it wouldn’t have had enough time to record the three transits necessary for confirming a detection before it broke down, unfortunately. 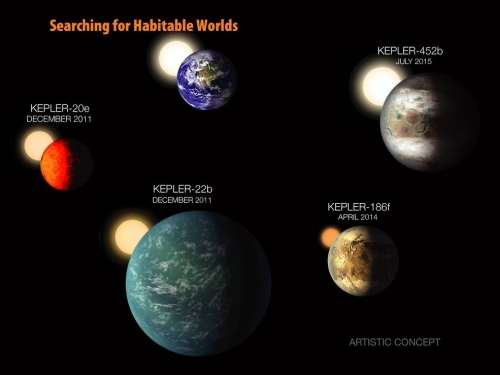 Things That Could Go Wrong With Habitabilty Of Kepler 452B – & Could We Detect Intelligent Life There? The idea of what that means by “another Earth” for astronomers who know the capabilities of Kepler, is rather different from what most of the general public would think of when you say “another Earth”. Kepler is great for getting an idea of what proportion of stars have planets, and what types of stars typically have planets, because it focuses on a small patch of the sky, using transit method, looking at lots of stars likely to be far away. 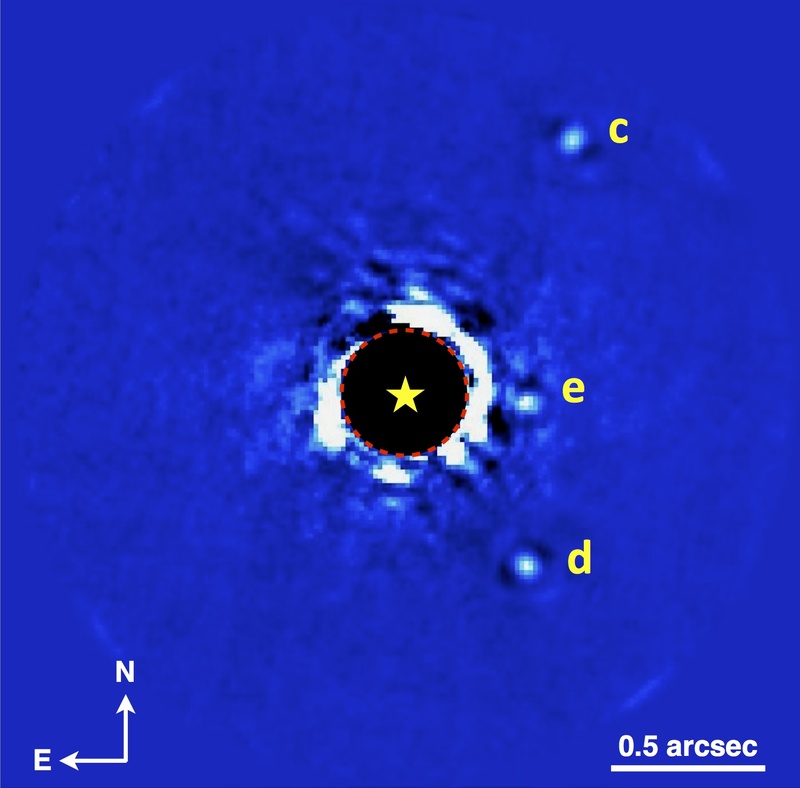 However it can’t tell much about these planets, except the diameter of the planet and its orbital period, and spectral type of its parent star. Anything else such as its mass is informed guesswork. So, anyone with that background knew in advance that this announcement could only tell us things like that, and understood the press release accordingly. Just from knowing that it was a Kepler press release. Unless just through luck it happened to find some nearby star, that is, but typically you expect them to be distant stars, at their closest, hundreds of light years away, so far away any light signal due to the planet’s atmosphere or surface would be very faint indeed and hard to analyse. But now that it’s found that some G type stars have planets like Earth – that means that perhaps it gets a bit more likely that we will find similar planets around some of the nearby G type stars, maybe even Alpha Centauri, or Tau Ceti or some such. Have any of these possibly Earth-like planets been found at such a distance that we could reach them using our current technology in a few hundred years? I know the hope is we’ll have the ability to send probes at higher speeds but, even then, if something is hundreds of light years away it may be interesting to philosophize about how those planets might be but visiting them isn’t feasible. Also, as with SETI, we assume advanced life forms would be capable of sending and receiving radio signals. But, at least here, that’s only been going on for about a century. Anyone aliens trying to send radio signals to Earth when the Egyptians were building pyramids and the Romans their roads, aqueducts and coliseum would have thought no one was home. Yes, I know there are lots of people who believe we have been visited by ETs but I don’t and the great distances involved may be the reason. Did humans always report visits by aliens? No. That’s a fairly recent phenomenon. In the Middle Ages when demons were on everyone’s mind people reported being possessed by and violated by demons. So, it seems our view of our world has a lot to do with our delusions? I know, much of this is off topic. You probably couldn’t find the outer solar system worlds in the solar system without either a very lucky gravitational lensing, or direct imaging the entire solar system perpendicularly on using a telescope with a coronagraph/occulter (like this). The orbital periods and distances are just too far to get transits on any reasonable period of time. Even a dedicated mission (Kepler 2) to examine our nearer neighbors in this way seems well worth doing, but I have a feeling that the same attitude that leads SETI researchers to think “We couldn’t be *that* lucky, to find another civilization so close by” would also lead the “exoplanet hunters’ club” to not be enthusiastic about such a mission. But if we never look for transits of closer stars, we’ll never find any planets that may be there (I’m not saying they *are* there, just that they could be there, and are no more [or less] likely to exist than transiting planets orbiting far more distant stars). I also think this planet is a mini-Neptune. I think any planet with a radius more than, say, 1.2 that of Earth is like to be a mini-Neptune. What has struck me is how shockingly few “Earth-like” planets have been found by Kepler, with most of them likely mini-Neptunes. Follow up observations are needed and Kepler would be perfect for them. Unfortunately because of the operational limits of Kepler during its K2 extended mission, the spacecraft can not be pointed stably at targets outside of the ecliptic plane and all the stars you cite can not be viewed by Kepler. NASA’s TESS and ESA’s CHEOPS missions scheduled for launch in 2017 should be able to observe them, however. More recent work does suggest that the transition point from 100% rocky to less than 100% (i.e. the size where mini-Neptunes begin to show up in the population) might occur around 1.2 RE (i.e. planets with masses greater twice that of the Earth) with high metallicity stars being more likely to harbor mini-Neptunes than stars of more Sun-like metallicity or less. Are there any stars that have *nothing*–not even asteroids or an Oort Cloud of comets–orbiting them? O and B type stars might not show any paucity of angular momentum due to even fairly massive orbiting objects because they’re so large and massive (plus they might have long since vaporized or “sublimed away” such objects with their intense heat and X-Ray emissions), but it would seem that all A through M stars (plus brown dwarfs) should have *something* orbiting them, even if only meteoroids and/or dust. Yes, but even planets with 1.2-1.3 Earth radii are likely to have thick “Venus-like” atmospheres even if terrestrial. On the related subject of habitability, what do we know about the past existence of plate tectonics on Mars? Is it possible that the Earth itself would have had a thick, Venus-like atmosphere had it not been for the giant, Moon-forming impact that we had stripping off much of that atmosphere? I’d be surprised if there are many habitable worlds around M-class stars. Even discounting the flaring and sunspots (which are common but not universal among red dwarf stars), there’s the higher luminosity in the extended pre-Main Sequence phase. A billion years of higher luminosity would turn nearly all of the planets in such a star’s habitable zone into super-Venuses unless they migrate in afterwards. I cannot believe the reporter said the Drake Equation looked “impenetrable”. It’s a linear equation for crying out loud that has been around since 1961 and is probably one of the most famous math examples right up there with E=mc2. Ye gods. tenable. What is the estimate time for Any liquid water on Venus to disassociate and recombine to create CO2 and H2SO4 I believe it’s less than 1 billion years. but for an example of a good candidate K star of about 80% the mass than our sun, is CD27 14659A in the constellation Capricorn. period lasting 60 or more hours introduces tremendous climatic chaos. to remove tide locking from the habitability equation for planets in their HZ. It is logically impossible to prove a negative (e.g. nothing orbits a particular class of star). But given what we know about star and planet formation and how quickly dust apparently gathers to form planetesimals then still larger bodies, even short-lived high-mass stars would likely have something orbiting them even if it is only a large collection of asteroid-like bodies. The fact that the Earth does not have a thick CO2 atmosphere like Venus has absolutely nothing to do with the giant impact that is believed to have formed the Moon. Earth does not have a thick CO2 atmosphere because of the carbonate-silicate cycle which has scrubbed most of the CO2 out of Earth’s atmosphere to form climatically inert carbonate deposits. Since Venus lost its water (probably during its first billion years), the carbonate-silicate cycle can not work allowing CO2 to build up in its atmosphere. With a 30% increase in radius the mass increases to around double the mass of the Earth, so there is more likely to be more low reactivity gases available. The higher gravity would also increase the pressure at the bottom of their atmospheres aiding absorption band broadening. I would think that as planets become more massive their atmospheres also proportionally increase on average. As I have said, nothing I have seen in the scientific literature on the subject indicates that rocky planets in the 1.2 to 1.3 RE size range must have thick Venus-like atmospheres. If you could cite some more recent work to the contrary, I would be most interested in reading it. The transit of a binary planet would have a photometric signature distinctly different from that of just a single world (e.g. a two-step dip in brightness with variations in the timing and duration of transits as a result of the two planets orbiting each other). I’m afraid that Kepler 452b is a single large planet. It is very unlikely a planet would hold say 100 atmospheres of nitrogen and also, depending on the temperature, of carbon dioxide. Carbon dioxide reacts readily in the presence of water to form carbonates reducing atmospheric amounts. Although there is little in the literature about the volatile quantities per planet mass in atmospheres surely increasing massive planets would have increasingly more massive atmospheric envelops as they would have simply accreted more. We will have to wait a while longer until we get a better view of these worlds and dimers may provide the tools to workout the pressures on these worlds. I too think that Kepler 452b is more likely to be a mini-Neptune. How distinct would the signature from a close binary be? Especially if the orbital plane of the binary wasn’t aligned with the line of sight to Earth? 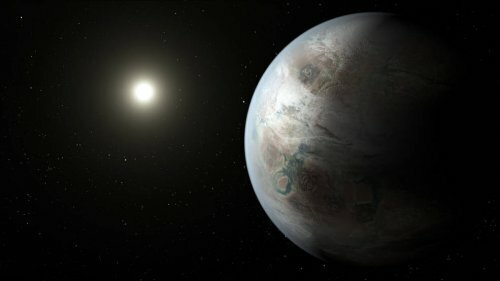 The article and comments discuss the potential habitability of Kepler-452b; yet we cannot really know if it is inhabited. However implausible, the idea goes, a super-advanced civilization could have terraformed this world and mitigated a potentially thick unfavorable atmosphere to make it more habitable for itself. We can’t thus really dismiss ETIs or biology out of hand in any star system with known planets. Likewise, this same ETI may have sculpted Kepler-452b into a nursery world for one of its pet projects. The argument goes further in this particular case since Kepler-452a is a K-class star with perhaps more stable conditions for forming life (as we know it). Guess we will have to wait for much further characterization and advanced spectrometry to know any better in this case. Earth does not have a thick CO2 atmosphere because of the carbonate-silicate cycle which has scrubbed most of the CO2 out of Earth’s atmosphere to form climatically inert carbonate deposits. I believe most carbonate minerals today are of biological origin. Limestone made from seashells, mostly. The carbonate-silicate cycle you mention is inorganic, it appears. How can this be reconciled? How can we know there was/would be sufficient CO2 fixation without the life that apparently has been involved in an overwhelming fraction of it while it existed? While various life forms certainly aid in the formation of carbonate deposits in Earth’s relatively recent history, they can and do also form abiotically (as is demonstrated almost every day in freshman-level chemistry labs sessions). In fact, that would have been the primary means of forming carbonate deposits on the Earth before the first organisms evolved to use carbonate skeletons around a billion years ago (give or take, depending how one wishes to interpret the genetic and fossil evidence). A more detailed discussion of abiotic carbonate deposit formation can be found in James Kasting’s excellent book on planetary habitability, “How to Find a Habitable Planet” (2010, Princeton University Press) especially in Chapter 3, “Long Term Climate Stability”. No radio signals so far. Shocking.